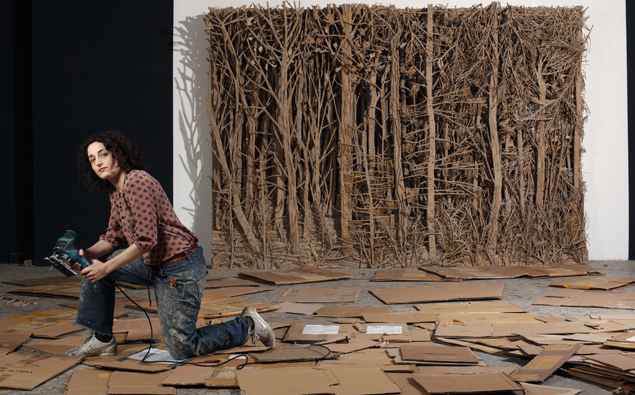 Born in Paris in 1975, Eva Jospin has created a unique way of bringing the life cycle of cardboard around full circle by turning back into the forest from whence it came – or at least, a representation of it. 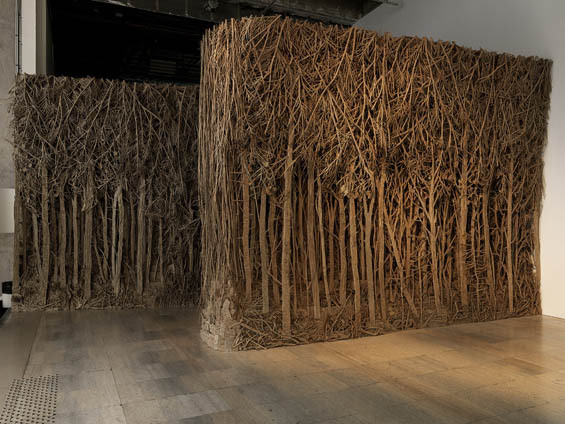 Reinventing the very nature of what makes a forest, she deconstructs the man-made and re-assembles it back into its original form. 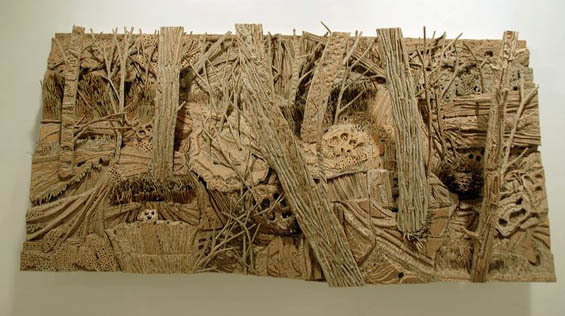 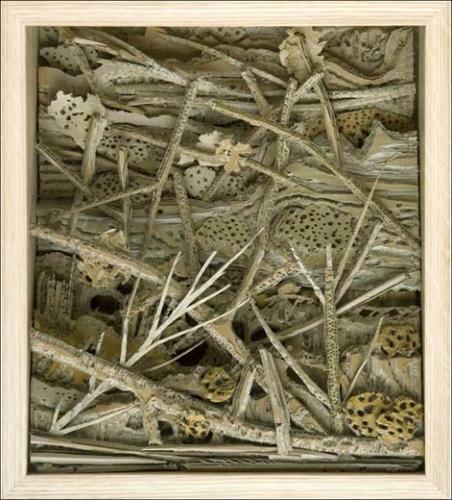 Ripping and cutting through piles and piles of cardboard, layering it expertly in arrangements to create bas relief and even 3-dimensional shapes, her pieces grow a renewed life of their own and become a metaphor for exploration of self and expression of the internal journey of human existence. 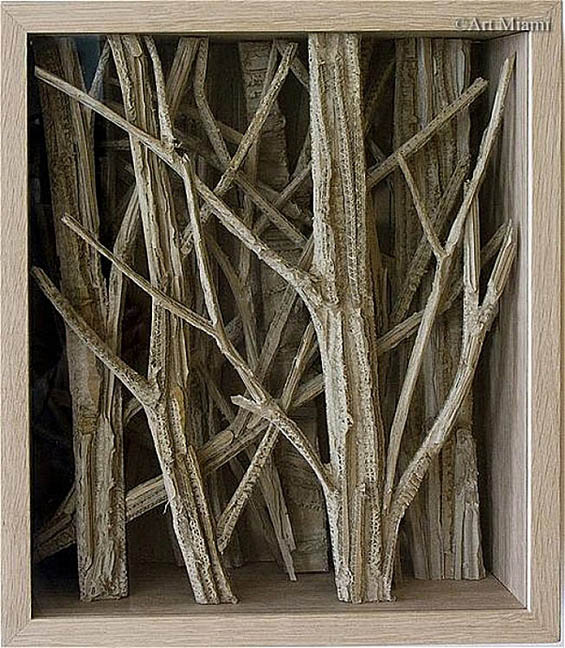 The juxtaposition of working with sturdy raw materials against the fragility and impermanence of nature itself is what lends a profound meaning to her work. 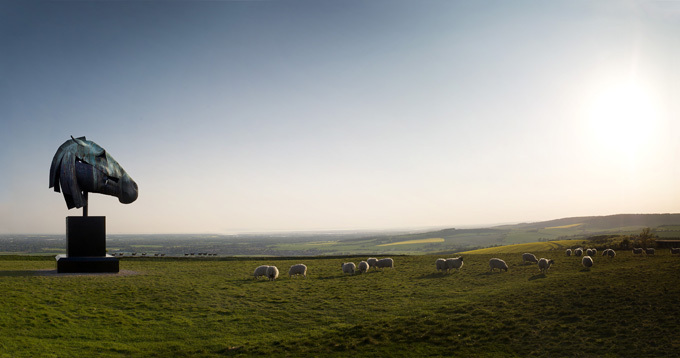 We are so connected to nature as humans living on this earth, and yet there is a major disparity and disconnect that we are constantly trying to overcome. 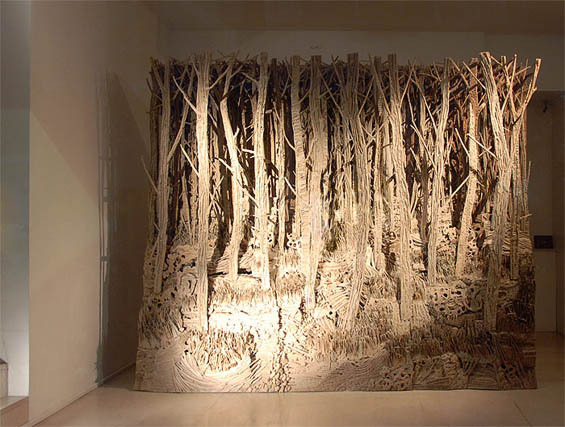 I’d love to see a giant installation of Jospin’s forest and get lost in it, wouldn’t you? 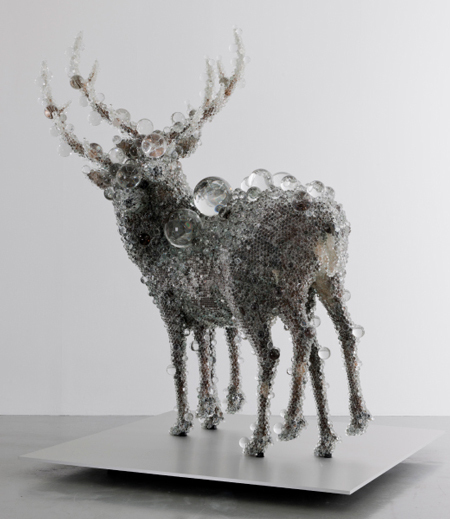 Kohei Nawa employs an intriguing technique in the development of his sculptures – he’s created what he’s dubbed “PixCell” beads to completely cover found objects, so that what was once a perfectly defined shape is now distorted and magnified on various levels, changing the object itself and creating a sort of bubble aura or “husk of light” surrounding each piece. 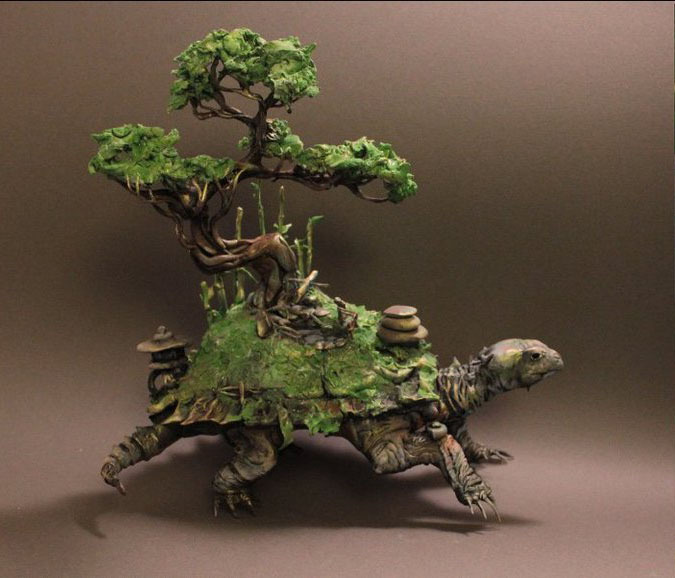 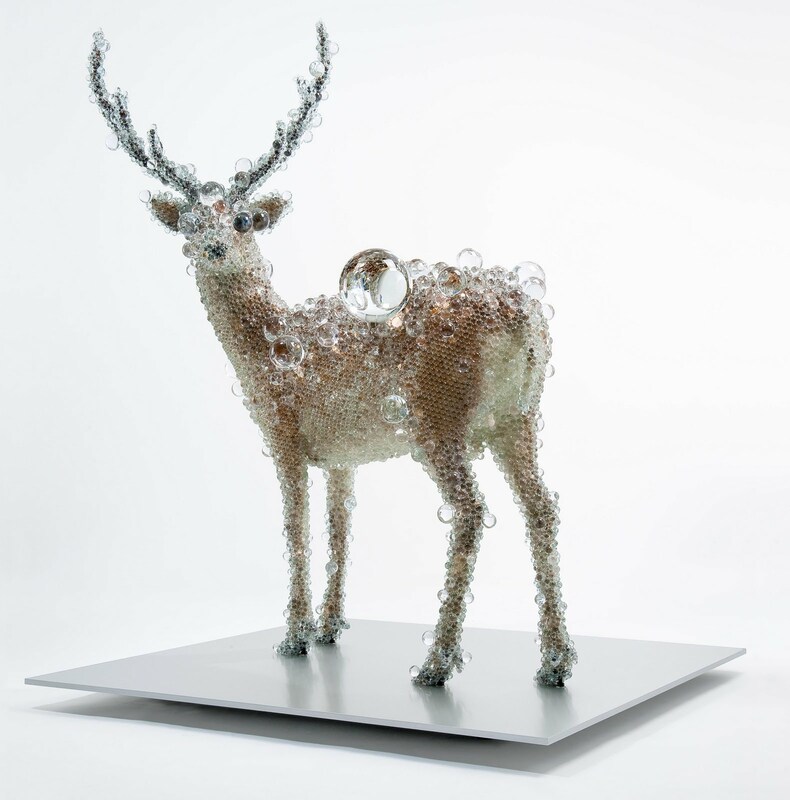 Using glass beads, glue, prisms, spray foam and plaster on taxidermied animals and other previously used vintage objects, he transforms their very essence into something truly remarkable and original. 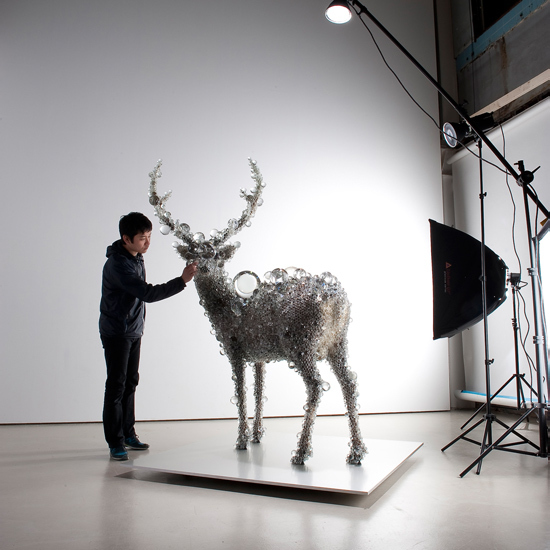 Nawa also currently takes on other design projects that involve different techniques and mediums via the artist collective space that he’s founded called “Sandwich” and was even asked to create original headwear for Comme Des Garcons’ Spring & Summer 2012 runway show. 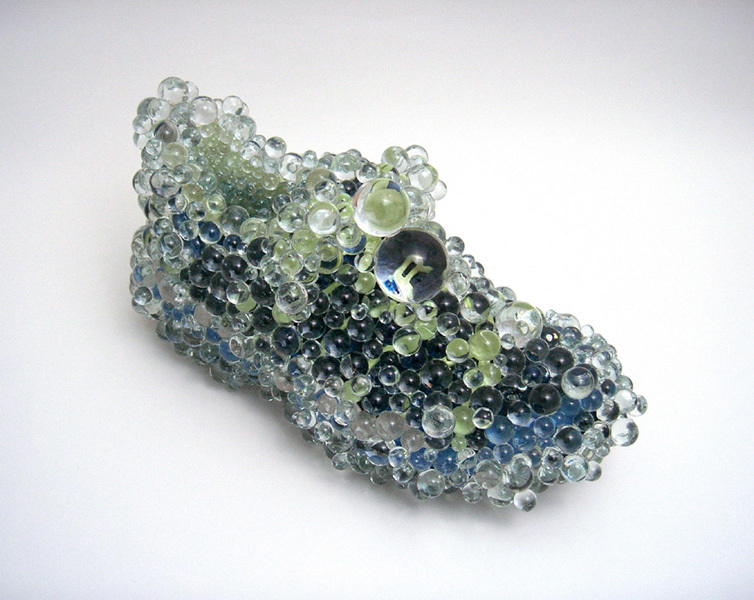 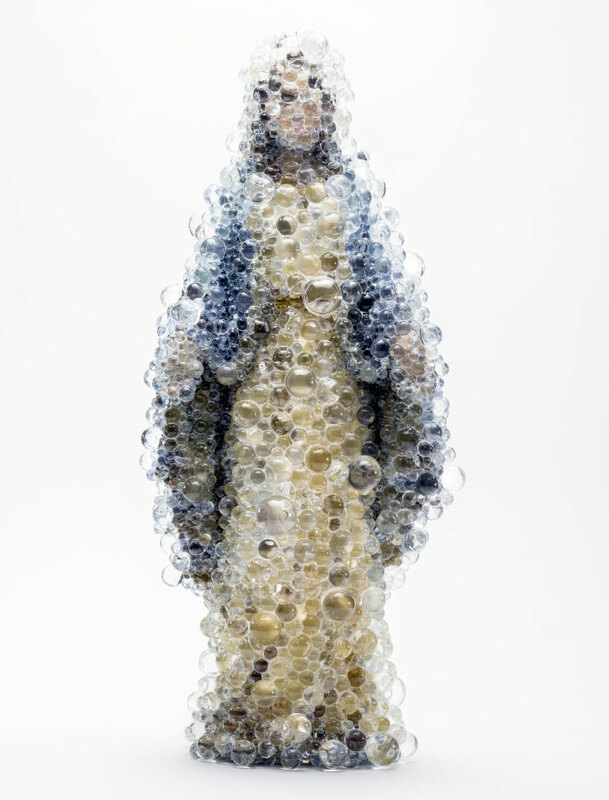 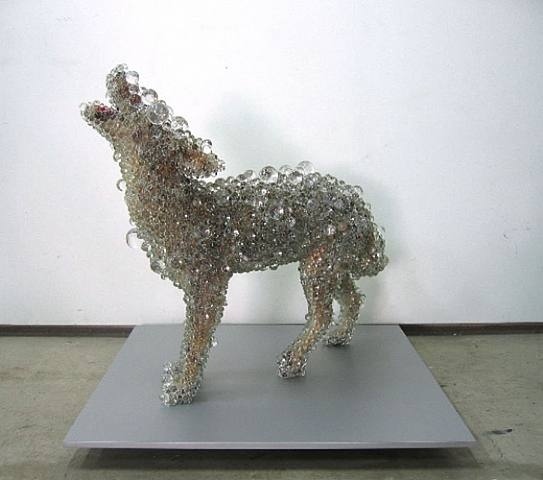 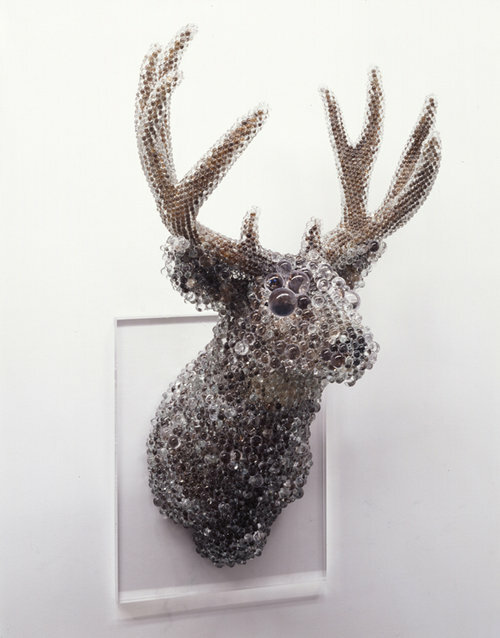 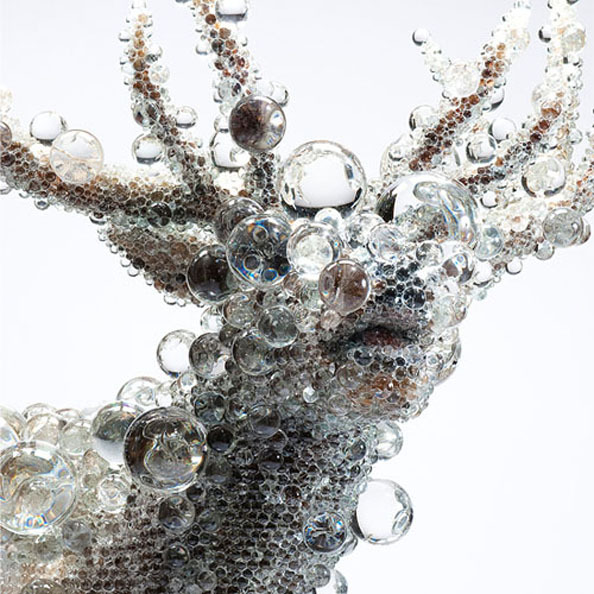 Discover more of Kohei Nawa’s work on his website. 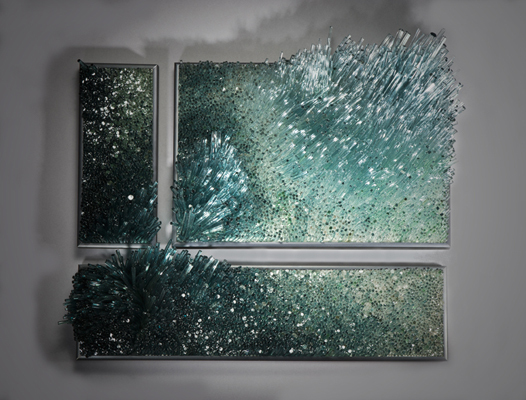 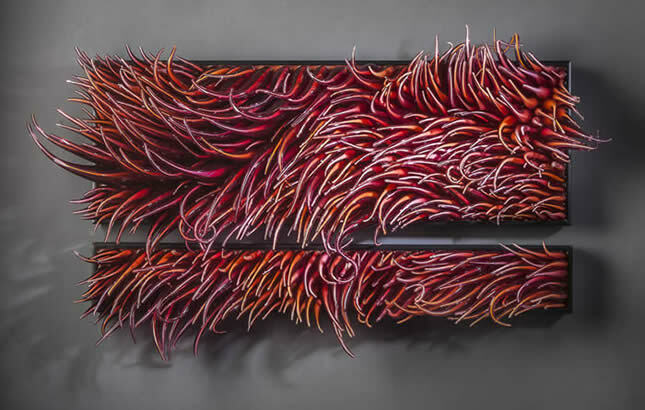 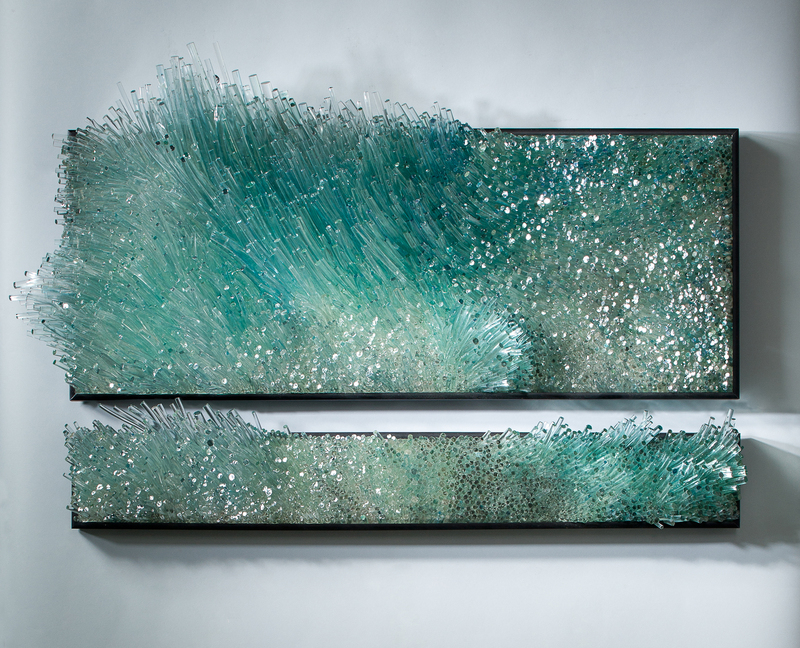 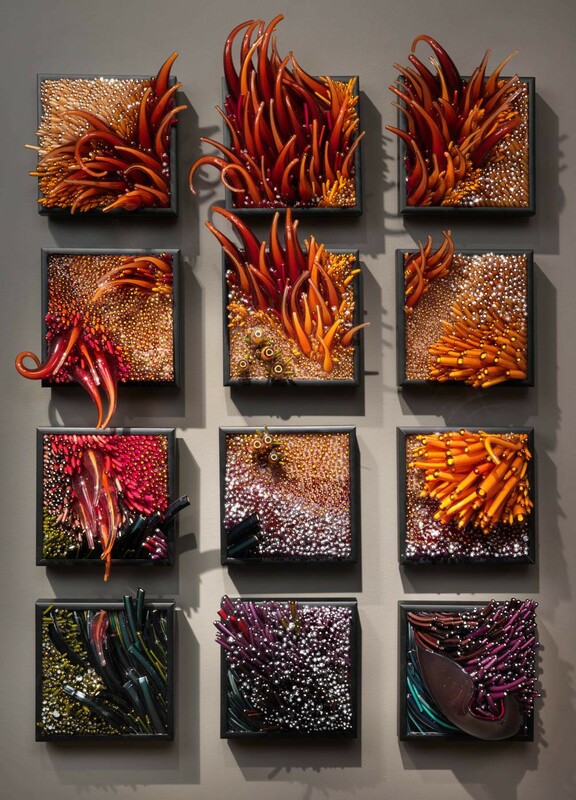 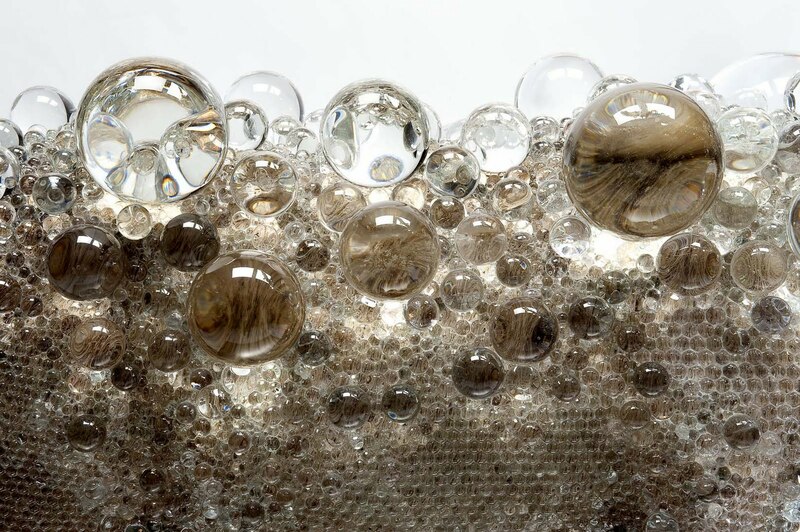 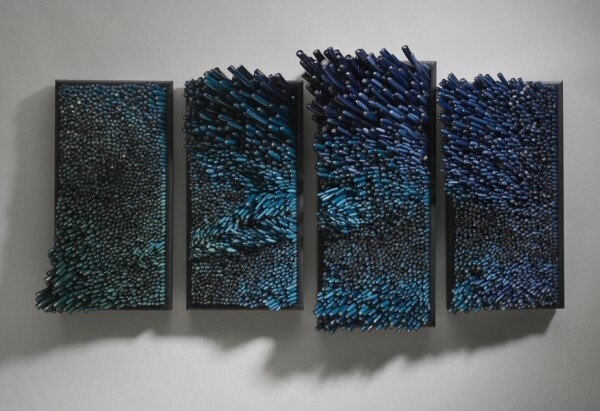 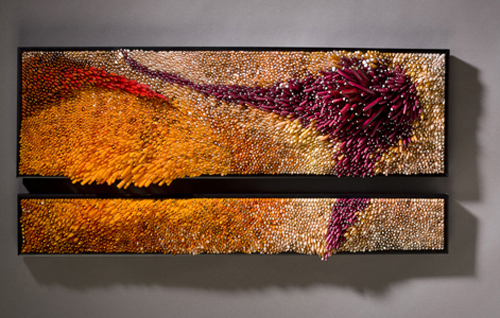 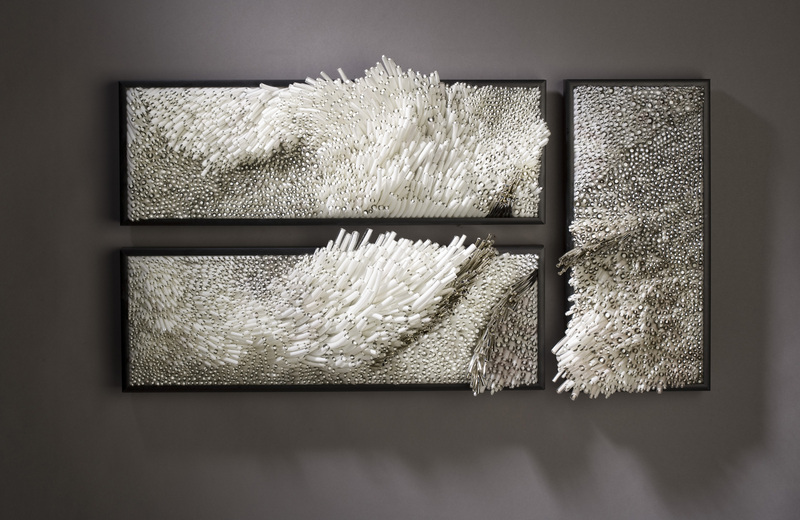 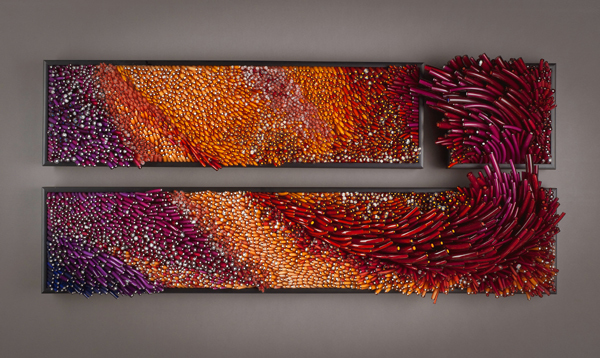 American glass artist Shayna Leib’s fascination with glassblowing started at the early age of seven years old, when she was first introduced to the practice at a local university. 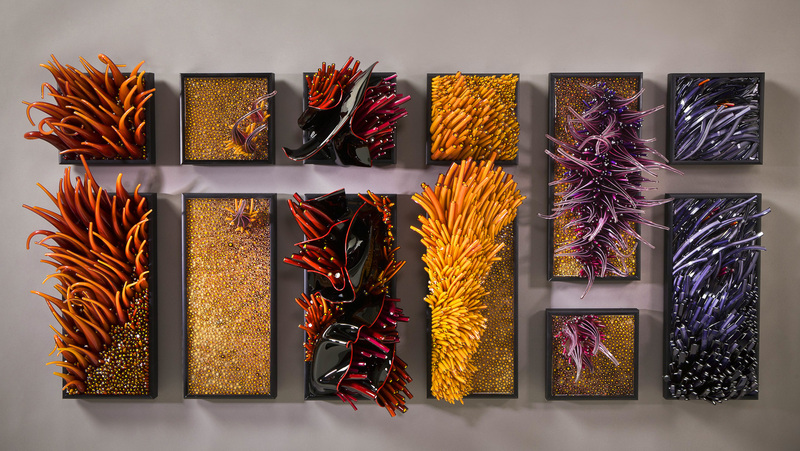 Since then, she’s grown and developed an incredible amount of skill in the art of glassworks, having studied at California Polytechnic State University and the University of Wisonsin-Madison, and focusing on the study of sculptural objects and the vessel. 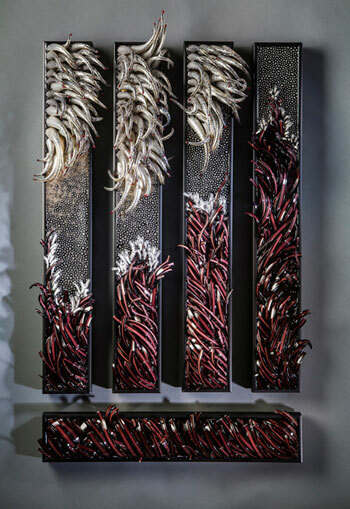 Aquatic-inspired forms and the beautiful otherworldly lines and colour qualities they possess, comprise the bulk of her work, as she redefines the use of glass to create an intelligent design aesthetic – almost lifelike in the way the forms coalesce, and how they work together when confined in rigidly-structured geometric boxes to create a gorgeous sense of style. 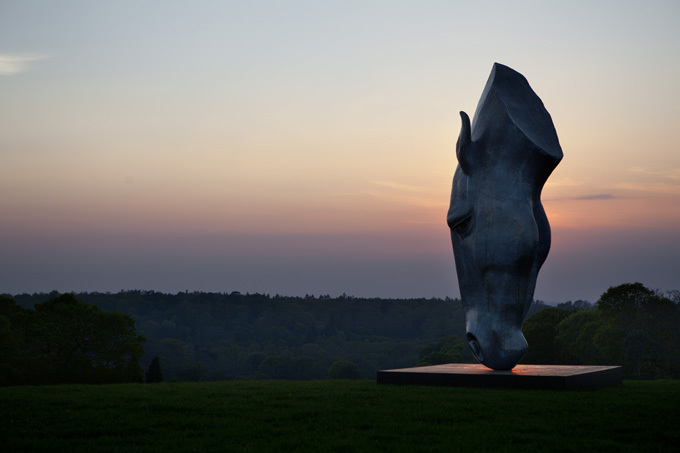 Working in a pastoral setting in Surrey, UK, sculptor Nic Fiddian-Green has been honing his skills as a master sculptor for decades with Andalusian horses as the main subject of his fixation. 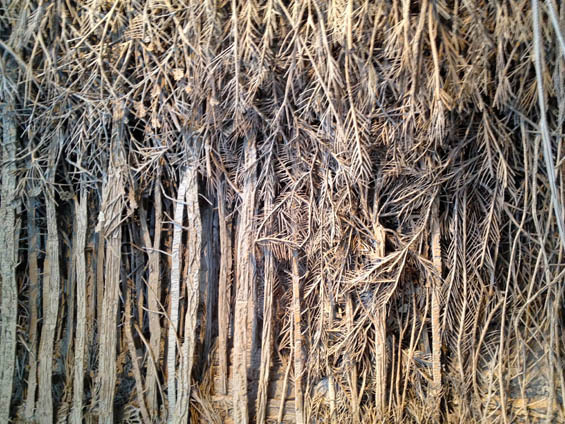 He’s spent a lifetime perfecting the art of the ancient “lost wax” technique after observing the fifth-century B.C. 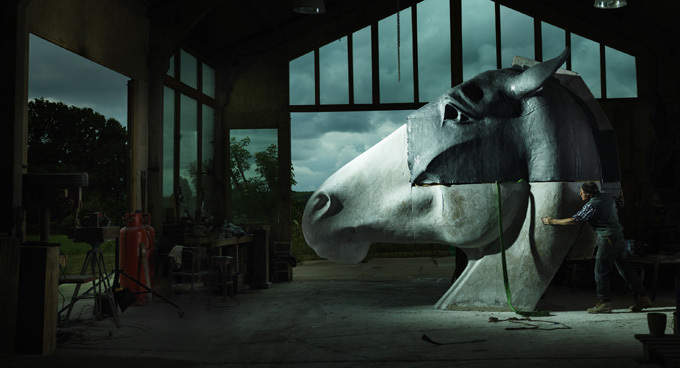 carving of a horse’s head, that belonged to Selene of the Parthenon, which was exhibited at the British Museum. 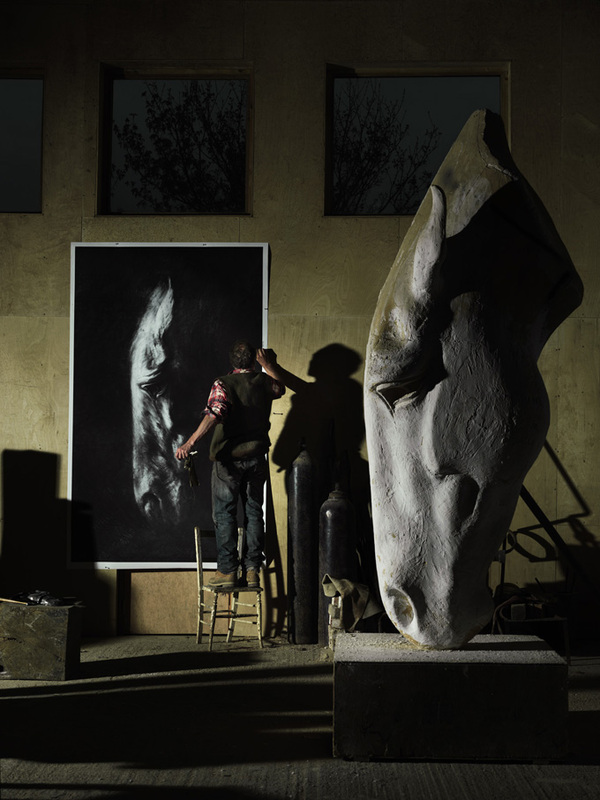 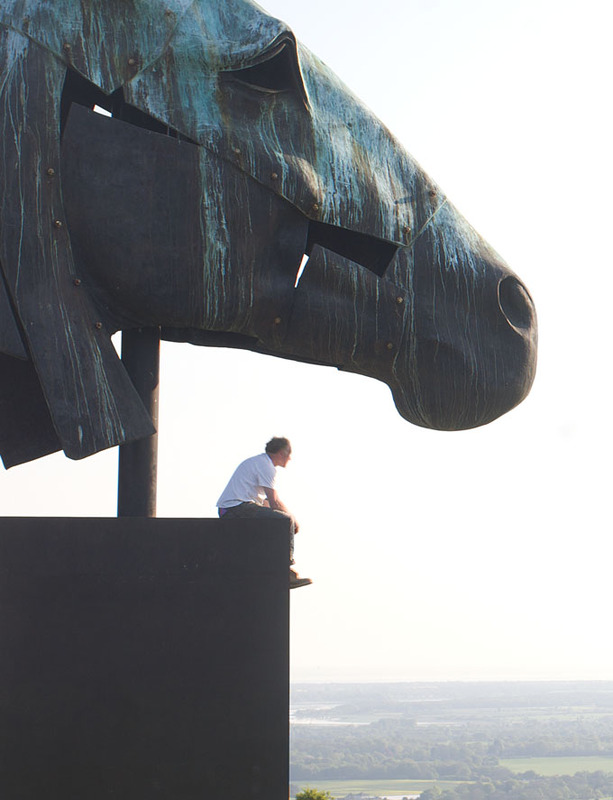 Working in plaster, clay, marble and beaten lead, he masterfully mimics the form and structure of the equine head and then oversees the process of casting it in bronze on a large scale and infuses a viscerally ancient and powerful feel to his works. 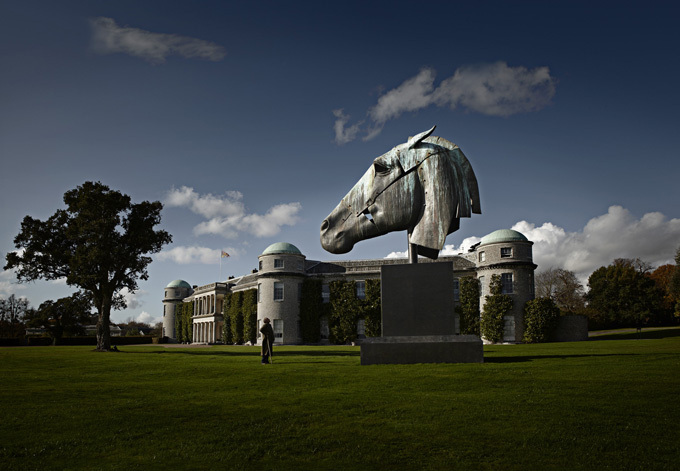 These beautifully-rendered heads are displayed all over the world in noteworthy locales, and have received critical acclaim from far and wide. 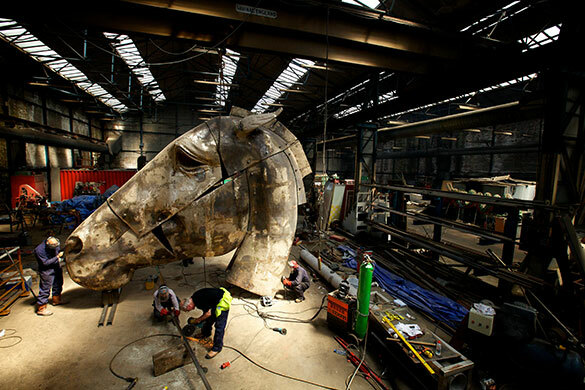 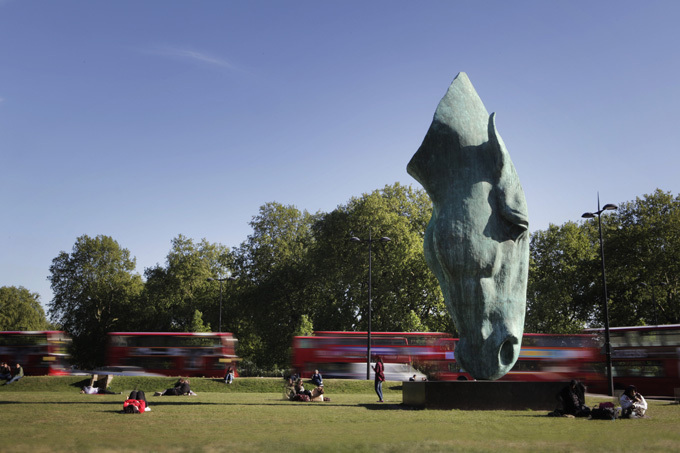 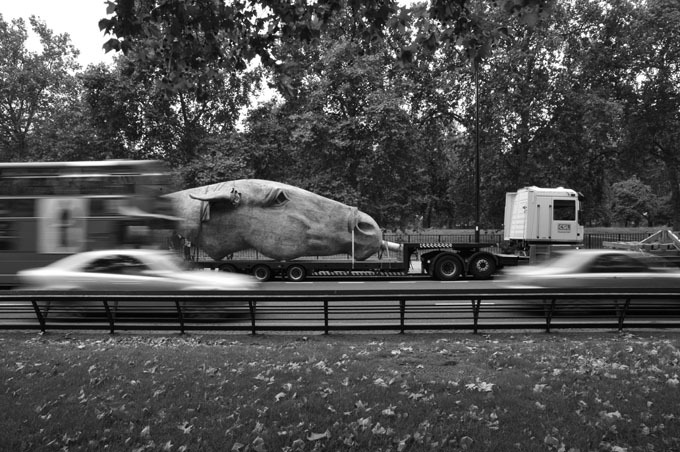 One of his sculptures, entitled “Still Water”, depicting the head of a horse drinking, is located right next to the Marble Arch in London and stands 30 feet tall. 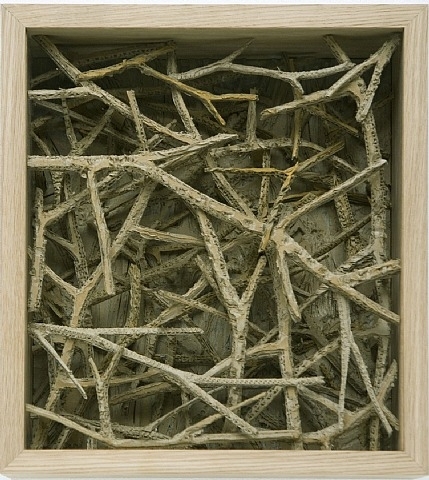 Celebrities fall over themselves to capture and collect his works, and he’s known to have sold to the likes of Ringo Starr, J.K. Rowling, Russell Crowe and Tom Cruise. 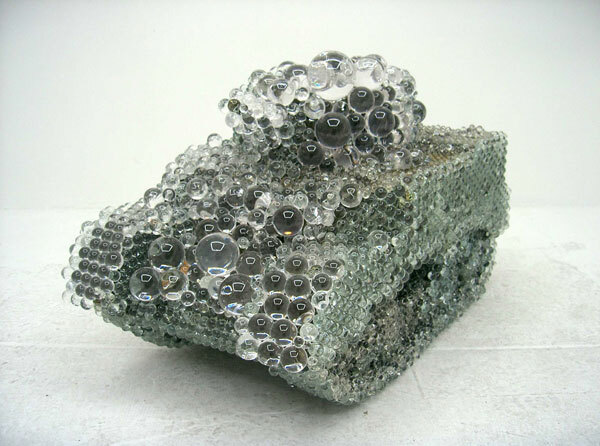 There’s something to be said for obsession in the world of art. 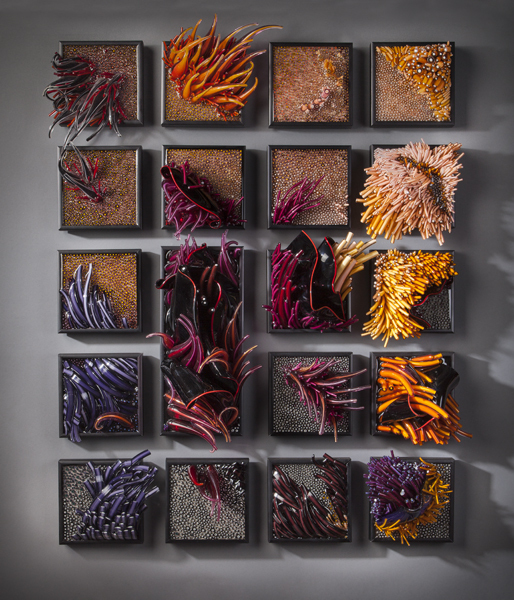 It’s what drives us to collect, cohere, and create. 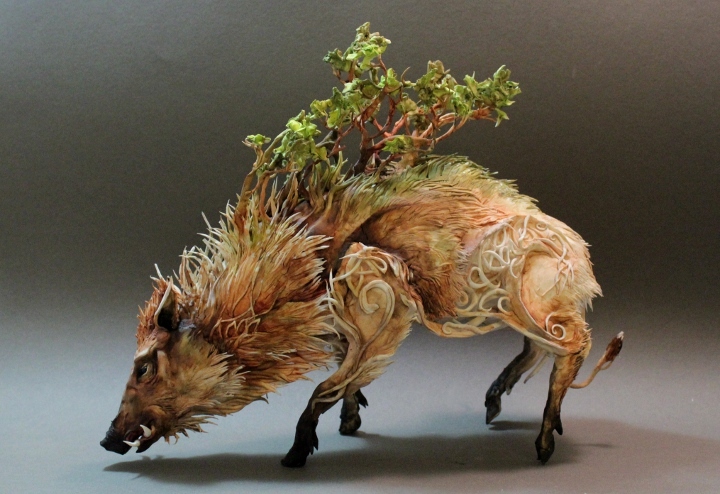 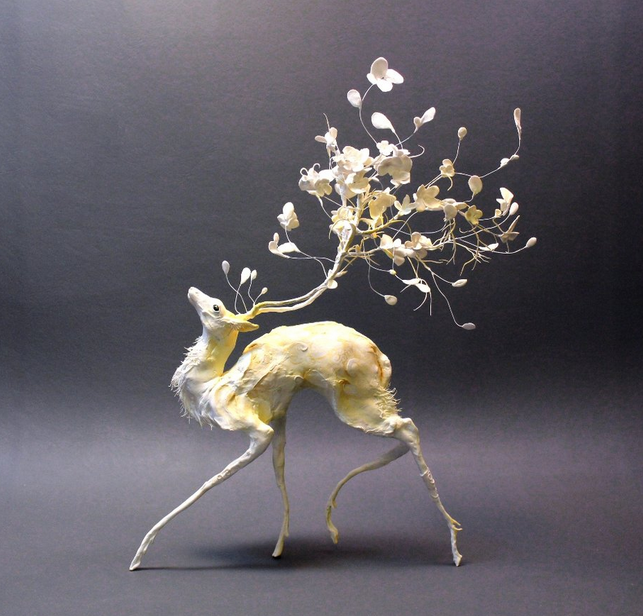 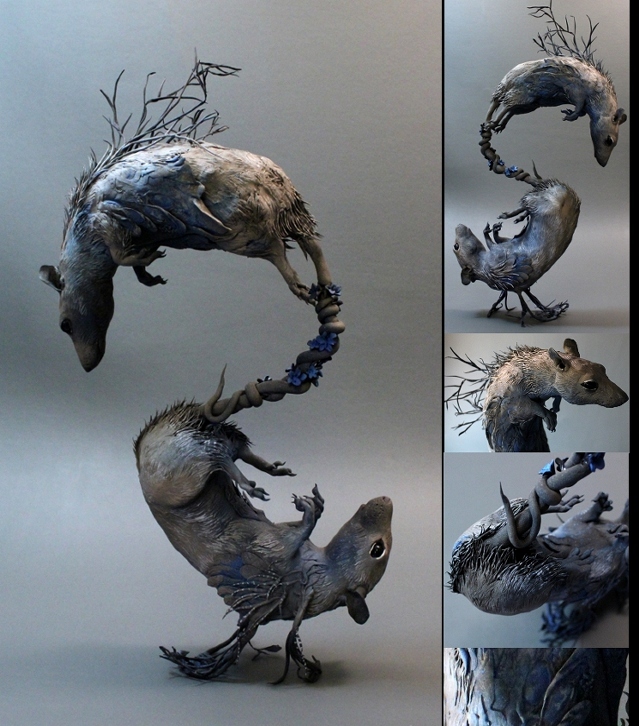 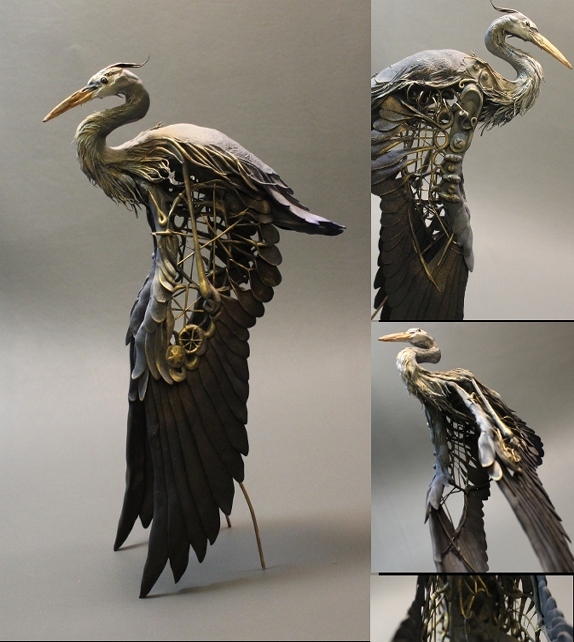 For Markham, Ontario native Ellen Jewett, her obsession with creating sculptural forms at a young age, and her love of biology are what propelled her into the wonderously surreal world of expressive sculpture that she thrives in today. 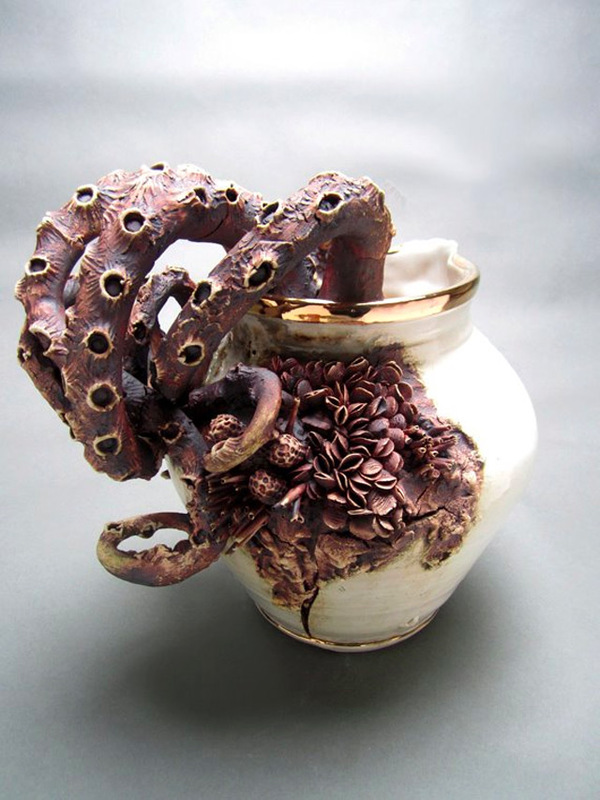 Having studied Biological Anthropology and Fine Art at McMaster University, she took her education as the groundwork to spring her forward into full time studio work almost immediately after graduating with honours, and continues to expand her knowledge with apprenticeships, additional professional classes, as well as teaching at various levels. 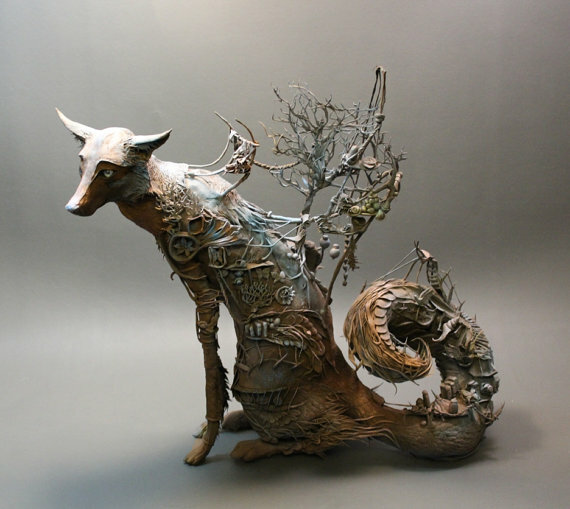 For Jewett, according to her website bio, sculpting is all about the idea of life itself, and the subtleties of the nature of biology; it’s narratives, movement, balance, and emotions. 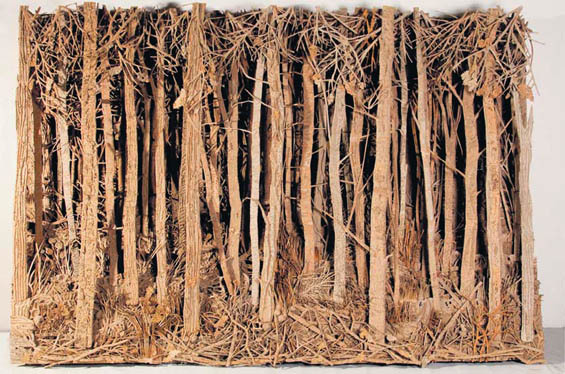 There is no limitation to the medium in which she works – she bends the laws of nature to create her vision rather than be constrained by her materials. 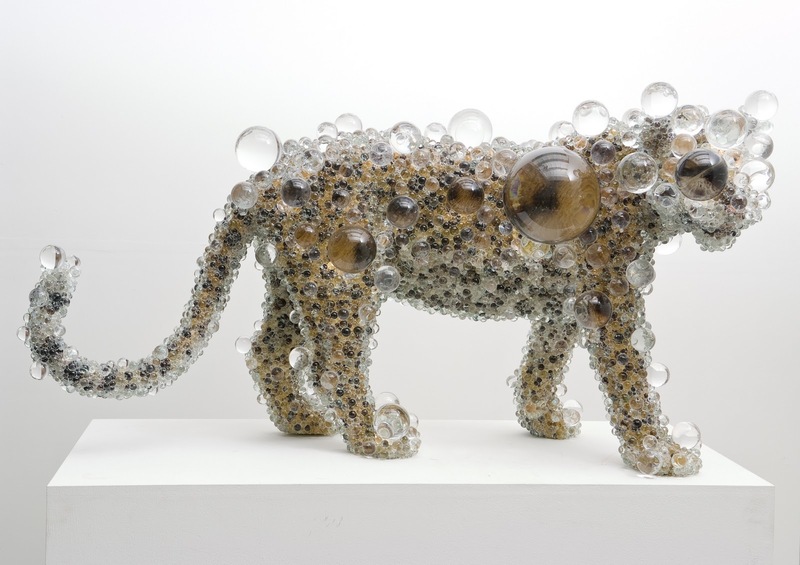 Her works are grotesque, and surreal, evoking the essence of the abstraction of biology and nature while effortlessly floating in an otherworldly ambiance. 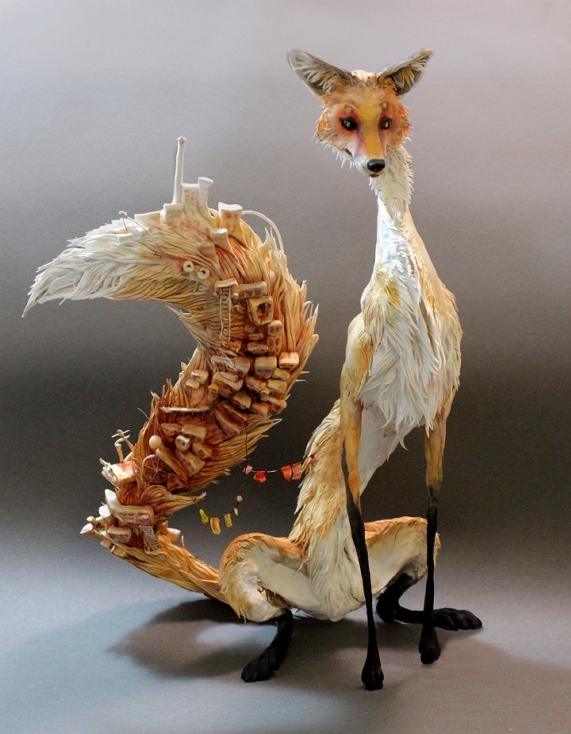 Personally, the Slum Fox is my favourite. 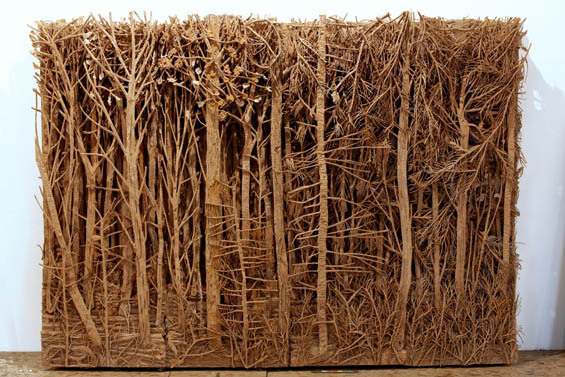 The expressive nature in which she constructs the forms and works with light and shadow is beyond compare. 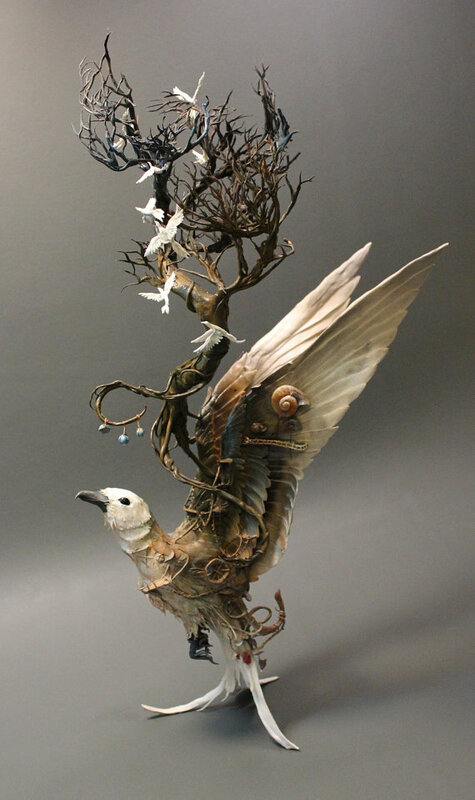 The details are so intricately crafted, and lend such a whimsical and fantastic quality – right down to the little clotheslines… they absolutely kill me. 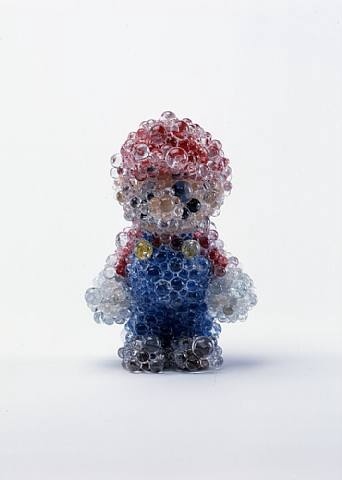 I wish this piece was still available because I would have bought it up in a heartbeat. 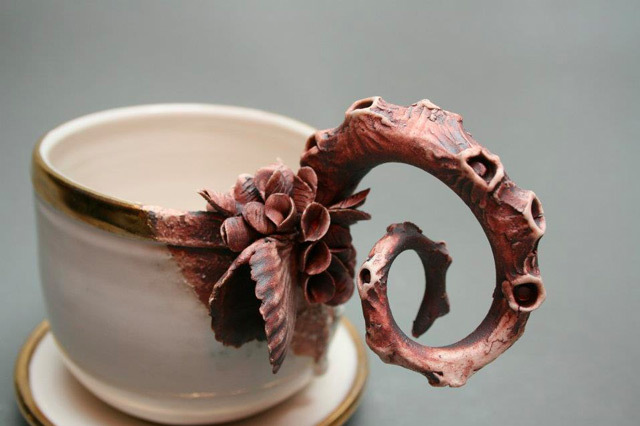 Check out more of her amazing pieces on her website. 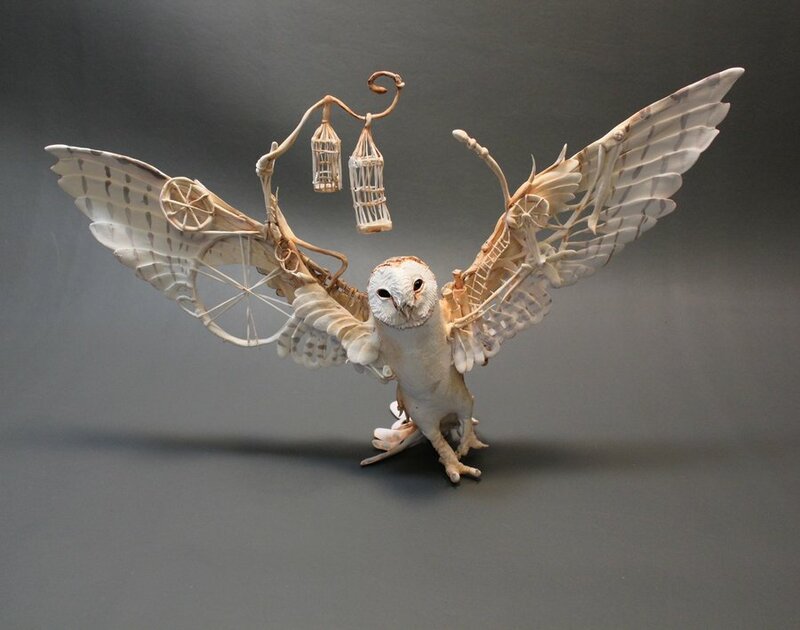 Buy from her Etsy shop. 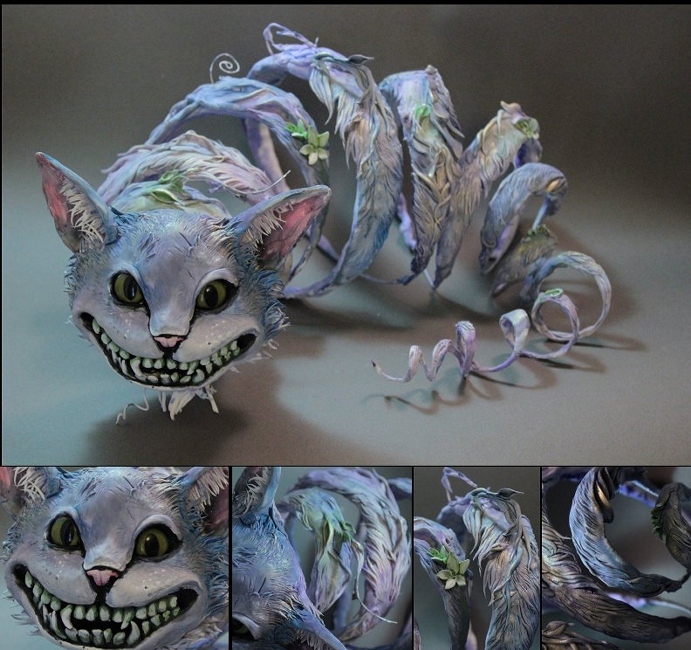 Check out her Deviant Art gallery. 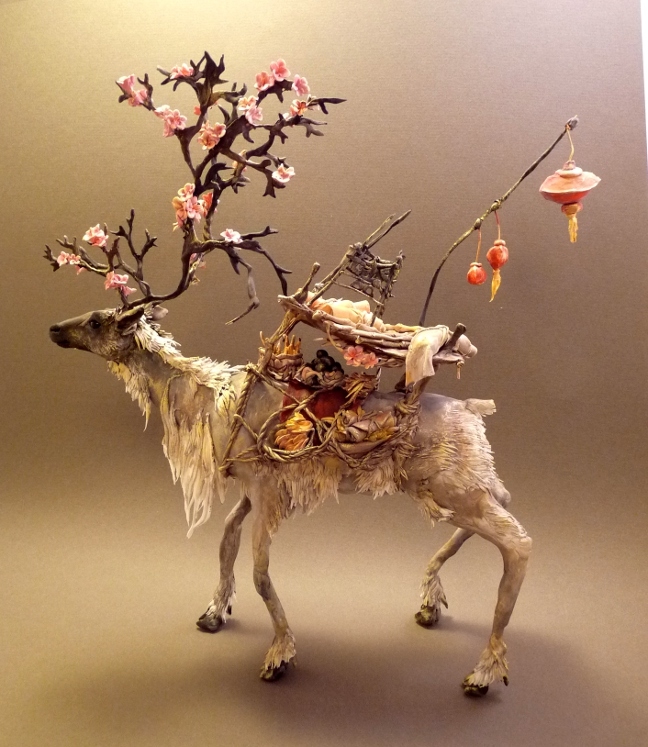 Keep up to date on exhibitions on her blog. 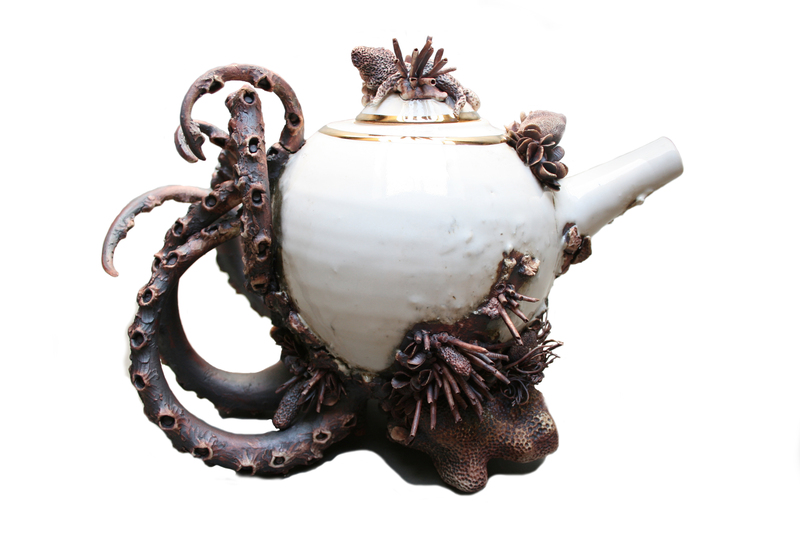 Mary O’Mally has a rare gift for creating porcelain crustaceans that make every day objects seem as if they were pulled out of the ocean after decades of being abandoned in shipwrecks. 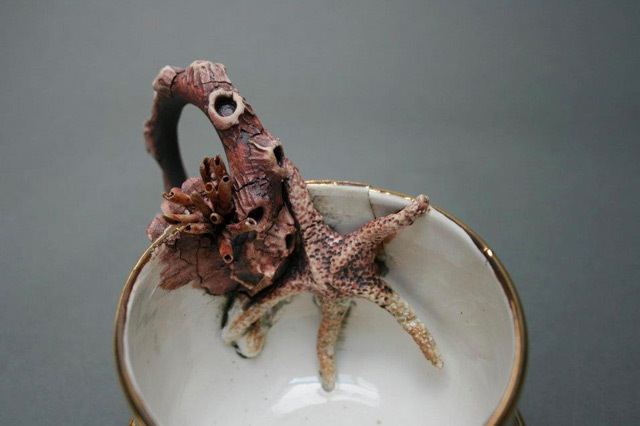 She currently works out of a barn on the southern shores of Long Island crafting some of the most amazing ceramics I’ve seen in a while. 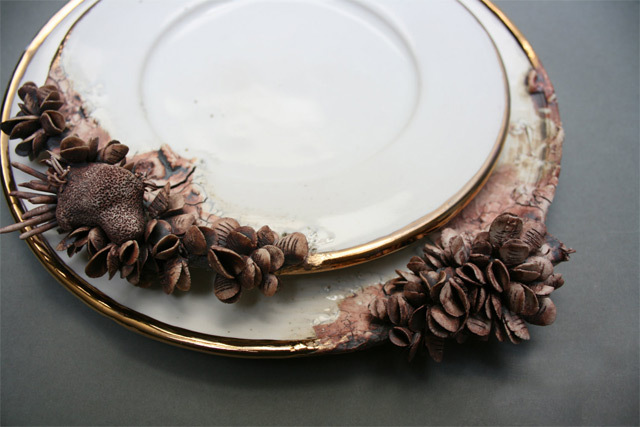 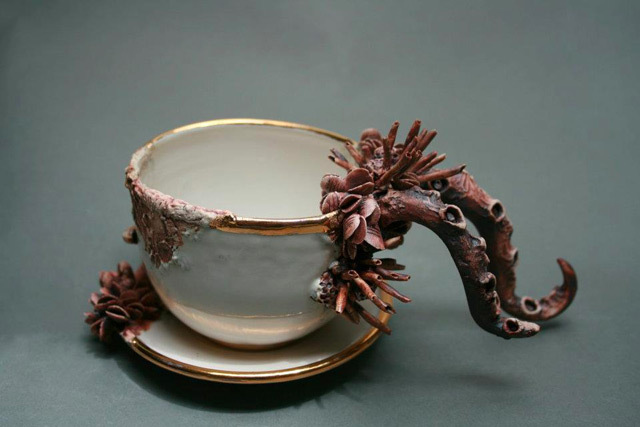 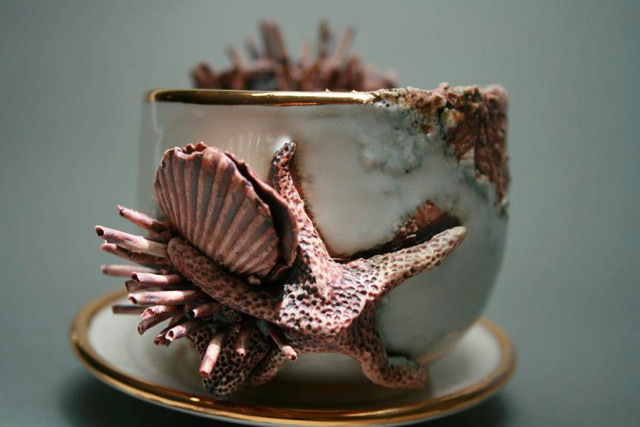 Under the name Bottom Feeders, she’s built up a great body of work that encompasses every form of tableware imaginable, crusted over with intricately crafted marine life. 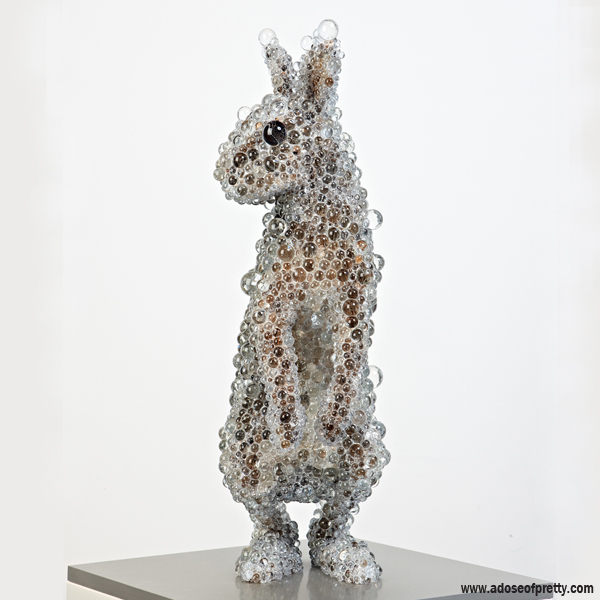 To see more of her work, see where she will be exhibiting next, or find out more about her, visit her website. 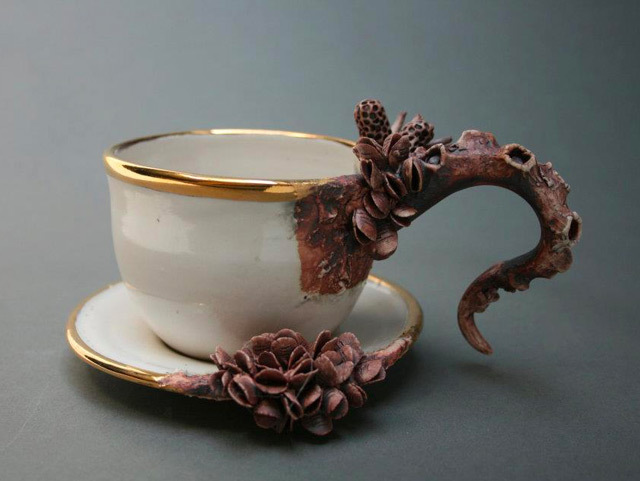 Shop online at her Etsy store. 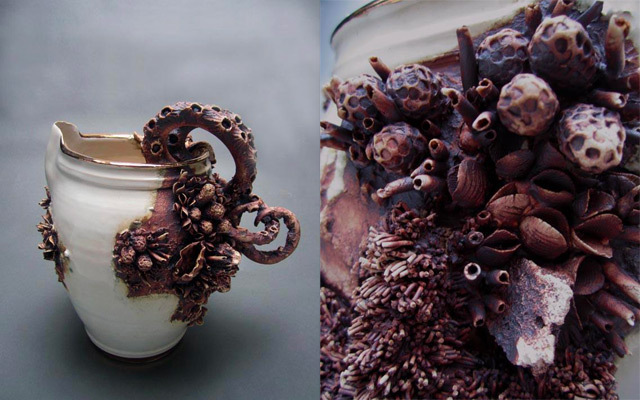 She also creates custom cremation urns.